Lobbyists across the spectrum are carrying out a messaging war over the Green New Deal, which the Senate is taking up today. Labor, environmental and industry advocates tell E&E News they're closely monitoring progress of the resolution put forward by Sen. Ed Markey (D-Mass.) and Rep. Alexandria Ocasio-Cortez (D-N.Y.). Their measure, introduced in February, would not create binding policy. It seeks to dramatically remake the country's energy sector, including through a rapid expulsion of fossil fuels from the United States' economy. But instead of asking lawmakers to vote "yes" or "no" on the resolution, which declares it "the duty of the Federal Government to create a Green New Deal," lobbyists are engaging in a communications fight. They are taking advantage of the moment to argue over the value of fossil fuels, the wisdom of a universal jobs guarantee and other key asks. "Let's face it, the Green New Deal is not going anywhere in this session of Congress," said Phil Smith, director of communications and governmental affairs for the United Mine Workers of America. "What it becomes is a discussion document. We are happy to have those discussions." The Edison Electric Institute, which represents the nation's investor-owned electric utilities, said its Green New Deal advocacy is focused more on framing the power sector as a positive force in the fight against climate change, not on the outcome of the resolution. "It's not a specific thing we're advocating on," said Alex Bond, the group's associate general counsel for energy and environment policy. "What we have been doing is we've been talking to everybody on the Hill about the progress that we've made as an industry," he said, noting the growing use of clean energy by utilities. Even groups representing industries that could benefit from a mandate for 100 percent clean energy, such as the Nuclear Energy Institute, aren't pushing for the resolution's adoption. When the deal was proposed, the group worked to clarify the role of nuclear power. At first, supplementary information said the plan would transition the nation to renewable power without nuclear, but Ocasio-Cortez's office later took down that information, so the resolution is now silent on the issue. "Our advocacy has been around the broader issue of ensuring that nuclear is recognized for the many attributes it brings to our energy system," said John Kotek, the nuclear group's vice president for policy development. The American Council on Renewable Energy is also not making a Green New Deal push. "We're not very focused on that vote. I'm not aware of anyone who thinks that vote is really a reflection of whether we're going to be able to make progress towards those ambitious goals," said Greg Wetstone, ACORE's president. Nonetheless, Wetstone said he appreciates the "enthusiasm" surrounding the proposal and is trying to transfer that into legislation that could be enacted in other areas, including on tax incentives and infrastructure. "It's not about enacting a resolution," he said. "In our mind, it's about translating that energy and enthusiasm and ambition into concrete things we can do to help build the renewable sector." 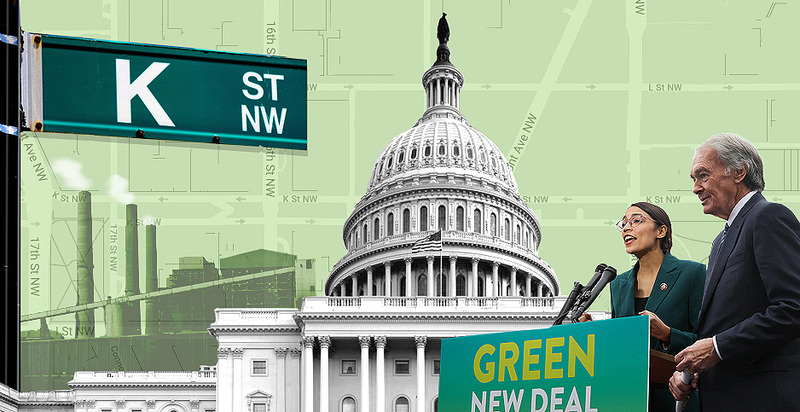 Some of Washington's most powerful lobby groups whose interests would be jolted by a mass reworking of the economy envisioned under the Green New Deal had little to say when contacted by E&E News for this story. The measure encourages farmers and ranchers in the United States to remove pollution and greenhouse gas emissions "as much as is technologically feasible." The American Farm Bureau Federation, however, noted that the measure touches on other policies not in the group's purview. "The Green New Deal expresses the sense of Congress on a wide range of issues, on some of which AFBF policy would probably conflict, but on a number of which AFBF has not taken a position," said a farm bureau spokesman, who added that the measure "would not enact new programs that would directly affect agricultural producers." The American Petroleum Institute touted greater use of natural gas, which has driven down the United States' carbon emissions, while also emphasizing that demand for oil and gas will continue for decades. "Congress' goal must be to balance meeting record consumer energy demand reliably and affordably for every American family while enabling environmental progress," said Sabrina Fang, a spokeswoman for the oil and gas trade group. The Green New Deal also pushes to upgrade every existing building for energy efficiency. The U.S. Green Building Council, which promotes sustainable construction and certifies green buildings, is not lobbying on the proposal, said a spokeswoman. Nevertheless, attention on the measure could spark other legislation. "The current GND proposal is a resolution — in essence, a stake in the ground," said Sarah Stanley, the USGBC spokeswoman. "We see the interest around a GND as creating opportunity for tangible policies that help address climate change, by reducing energy and water consumption, creating jobs and enhancing community resilience, all ultimately improving quality of life." Stanley cited tax incentives for retrofitting buildings, funding for energy-efficient housing and training for green jobs as some of those policies. Environmental organizations have tried to capitalize on the energy from the legislation. They see their lobbying as a messaging fight about global warming, not a legislative battle over a specific proposal. 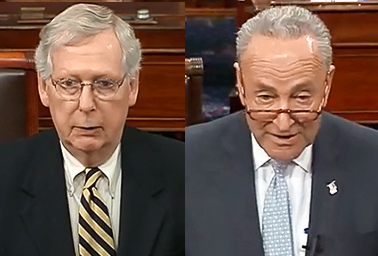 They've labeled this week's vote a political stunt by Senate Majority Leader Mitch McConnell (R-Ky.) and say that the nearly guaranteed rejection by the upper chamber won't kill the spirit of climate policies that are aggressive enough to match the real problem. "One of the most valuable pieces to come out of the Green New Deal is that we're starting to see members of Congress talk about the scale of the challenge when it comes to solving climate change," said Aliya Haq, director of federal policy for the climate program at NRDC Action Fund, the advocacy arm of the Natural Resources Defense Council. Haq and other greens don't even mind if Senate Democrats vote "present," as Minority Leader Chuck Schumer (D-N.Y.) is encouraging them to do. "Our strategy all along was to not put too much focus on the vote, because we think it's a sham vote, and that Mitch and most of the GOP elites are not at all intending to use this vote as a way to actually take action on climate change," said Lauren Maunus, a political organizer with the Sunrise Movement, the youth-led group credited in part, along with Ocasio-Cortez, with bringing the Green New Deal to the spotlight. If Democrats vote "present," Maunus said, "it's easier to move on and not give more attention to this game that McConnell is trying to play." Sara Chieffo, vice president of government affairs for the League of Conservation Voters, said the group endorses the Green New Deal, even if it views McConnell's move to bring the proposal to the floor as a political stunt. "What we are doing with this vote is to make sure the public understands that there is widespread support for bold climate action and Senate Democrats are united in their commitment to act on climate change," Chieffo said. "The public needs to know that Sen. McConnell has no plan to act on climate change." The Green New Deal also works to address the concerns of unions, saying the switch to renewable energy should come with high-quality union jobs and support for collective bargaining rights. But some in the labor movement have been frustrated by the proposal. Smith with UMWA said his union has not been on Capitol Hill lobbying against the Green New Deal but is talking to lawmakers about how to best approach climate change and how to help communities affected by it. "Developing a piece of legislation that would eliminate every coal mining job in the country would have a huge impact on us, so you would think they would want to have a conversation with us," Smith said. "Calling for 'a just transition' doesn't cut it." UMWA is not sitting out the debate over climate change, he said. The union lobbyist has been circulating a white paper by the United Mine Workers and other unions among lawmakers on labor positions regarding climate change legislation. The paper even calls the famous Waxman-Markey carbon cap-and-trade bill from 2009, co-authored by the Green New Deal's Senate champion when he was in the House, "a good starting point for discussions about future climate legislation." That said, UMWA also signed on to a letter with nine other unions in the AFL-CIO energy committee that said the Green New Deal "makes promises that are not achievable or realistic." So did the Laborers' International Union of North America, whose members often work on oil and gas pipeline projects that would be phased out under the proposal. "We are not lobbying on it, but we have made it clear to everybody on the Hill what our position is," LIUNA General President Terry O'Sullivan told E&E News, adding that he views the resolution and its upcoming Senate vote as "strictly politics." "For one, I don't see it going anywhere," he said. The Green New Deal touches on too many convoluted issues at once that need their own solutions, he added. "We find it frankly irresponsible to combine climate change, infrastructure and social programs into one package. The issues are complex and should be handled separately," he said. O'Sullivan said he hopes lawmakers will move onto an infrastructure bill after this week's vote. Other unions are excited about the Green New Deal. Fernando Losada, collective bargaining director for National Nurses United, said his union welcomes the resolution, saying it has been "very positive in supporting a climate justice movement" and is "stimulating a conversation on what needs to be done at this critical time." However, he noted that the proposal is just a resolution. "As concrete policy measures, those still have to come," said Losada, who also coordinates NNU's environmental justice work. "There have been bills that would be essential for any successful Green New Deal, and we have supported those and will support those." The Service Employees International Union's Local 32BJ, which represents more than 160,000 workers on the East Coast, recognized the objections by some unions but said the Green New Deal presents a prime opportunity to advocate not just on climate change but on other major labor priorities like health care and justice. "We have members whose livelihoods depend on the fossil fuel economy, too, who are facing the threat of displacement, or their communities have the threat of loss of tax revenue or their jobs," said Héctor Figueroa, the local's president, referring to the letter from the opponents. "We feel that being supportive of the Green New Deal recognizes that these changes are inevitable," he said, adding that "a union can't be a union just for the members that we have now. Our mission statement is to have a union for generations to come." A Markey aide said the senator's office worked with the labor community in developing the Green New Deal, noting that it calls out unions as essential for the mobilization. Furthermore, his staff worked with union representatives and members of the environmental community from the beginning of the drafting process, the aide said. The AFL-CIO has been involved in discussions with lawmakers on the Green New Deal, according to a spokesman for the nation's largest labor federation. Some ardent opponents of the Green New Deal have undertaken fights against it and see the Senate vote as an opportunity for a definitive statement. Colin Woodall, senior vice president of government affairs at the National Cattlemen's Beef Association, said the proposal is a "full-fledged attack on food production in this country, plain and simple. Whether the intent was that or not, that's how we understand it." Woodall and other opponents have accused the Green New Deal sponsors of trying to eliminate cattle ranching. That's in part because of the since-retracted fact sheet from Ocasio-Cortez that said the resolution called for "net-zero" greenhouse gas emissions "because we aren't sure that we'll be able to fully get rid of farting cows and airplanes that fast." Woodall said his message is clear. "We're part of the solution, we aren't part of the problem — especially what we can do with grazing grasses and turning it into high-quality protein," he said. "That's unique to our system of livestock production, and we want to be able to continue that." For Mandy Gunasekara, president of the pro-Trump, pro-industry energy group Energy 45 Fund, the Green New Deal is illustrative of Democratic environmental policy, and she wants to make the fight about that. "Part of my criticism against the left's approach to climate and the environment is that it's more about expanding control versus addressing attainable issues that we have the ability to change. 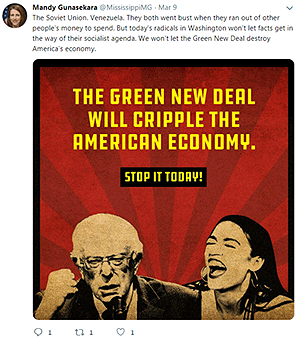 And the Green New Deal really encapsulates that," she said. "It makes very clear what their overarching objectives are." The issue has taken up much of the former Trump EPA air official's time, particularly in conservative forums such as Fox News, Fox Business Network and a Congressional Western Caucus event. "A lot of what I'm focusing on is creating a more robust conversation on the national news mediums, and this is what everyone wanted to talk about," she said.